It’s the end of another day and time for bed. I just stood in front of the bathroom mirror and brushed my teeth and took my hair out of the small ponytail I have been wearing this past week. I pull it back because it covers the hairless portions of my scalp. I have an autoimmune disorder called alopecia areata. Periodically, my immune system tells my hair follicles that they are alien and the hair must go. I end up with these patches on my head that have no hair, and it bothers me. It makes me feel odd and unlike those around me (women more than anyone else) with full heads of beautiful flowing locks. As a small child I had plenty of hair and wore it long in a braid or a ponytail. My sisters always had their hair short, but mine was allowed to grow out. In pictures from my youth it is always there. 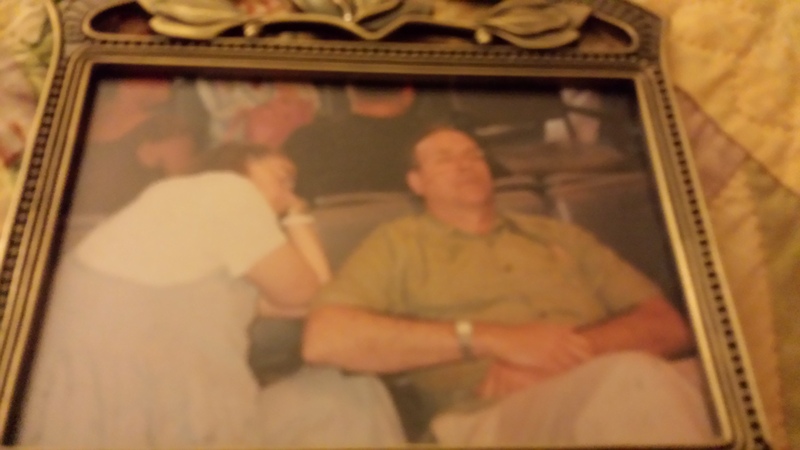 That’s Steve and I, sick and asleep at the end of that trip to Germany. You can’t see it, but about 60% of my hair is gone. In 2005, I noticed one day when I was doing my morning routine, pulling it back into a scrunchy…there was a lot of scalp showing and it scared me. I was getting ready to travel with our church choir on a relational journey to Germany and Austria, to share God’s love and good news through music. I couldn’t get to a doctor fast enough before we left, so I took a hat with me to cover my head’s near nakedness. I hated the way I looked and it made me feel less than human. How could a woman be bald? People would stare, wouldn’t they? They would look at my lack of hair and not be able to hear what I had to tell them through music. It was devastating. On that trip we made a visit to Dachau, the German camp where thousands were put to death because they were Jewish. The first thing they did to the prisoners there upon coming to the camp was to shave all their hair, whether they were women or men. I remember seeing the pictures displayed there and mourning for the way we can dehumanize those who walk this earth with us because they are different from us: different in their ethnicity, in their family of origin, in their faith. I remember looking into the eyes of those in those old photos and seeing only their humanity. We were the same: flesh and bone, man and woman, parent and child, human, made in God’s very image. And he knows the hairs on our heads or the lack thereof. And I wept not for the loss of my hair or their hair, but for the simple fact that we were all part of the human family: God’s children. And we had found a way to take that away from each other. Today, that is happening in other parts of the world. There are those who would drive away their neighbors because their expression and belief of God and his word are not the way they see it. They drive them from their homes and all they know and all they have for the sake of some sick, twisted ideology. They are rejected for no good reason, like my body rejecting the hairs on my head as alien. This is not of God. This is part of the brokenness of humanity. And so today when I look in the mirror I am looking past the bare places on my scalp. My identity is not there. It is with my brothers and sisters sent wandering again into the wilderness. Their homes have been marked with a symbol that someone else sees as derogatory; a mark of humiliation, like the shaving of hair. 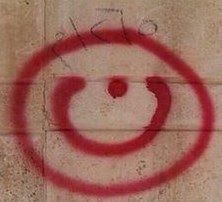 They have been called “nasrani,” expressed with the Arabic symbol for the letter n. They have been called Christian. And I will wear that symbol with them. We are family. Our identity is found with our triune God: Father, Son, Holy Spirit. And he knows the hairs on our head. Such powerful words and images. We fret about such trivial things in our lives and I have to remind myself that God loved me enough to know my name and call me forth into being and every other person too. Human cruelty and the ability to cause another pain is beyond me. Thank you, Sally. I have never wanted to claim my identity as a Christian and child of God more than I have since I have walked with these brothers and sisters. They are a powerful witness to me of how God’s light shines in very dark places. And the darkness does not overcome it.